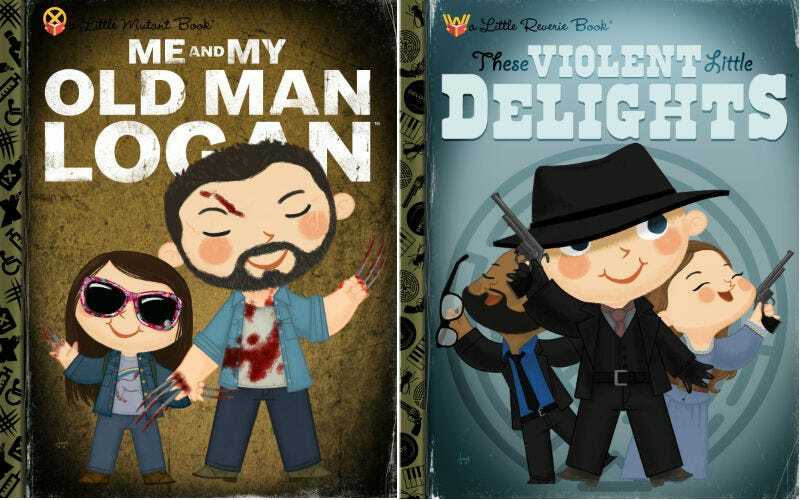 There’s something heartwarming about seeing your favorite science fiction and fantasy films turned into kids’ books. Morphing brutal, hard-R rated content in happy, funny ways is the trademark of artist Joey Spiotto, who’s about to debut another new series in this vein. This weekend, Spiotto opens Storytime 3 at Gallery 1988 East in Los Angeles. Like the title says, this is the third such show of these works (you can see the last two here and here), and once again, Spiotto has mixed a slew of new properties (like Westworld, Suicide Squad, and Logan) with a bunch of old favorites (like The Matrix, Spaceballs, and Child’s Play) for a simply delightful-looking show. Here’s the reveal of about one-third of the 40 pieces in the show, which opens April 7 and will go online April 8 at https://nineteeneightyeight.com/. Oh, and in case this isn’t obvious, these are just covers. He didn’t actually write books. The show opens at 7 pm, April 7, at 7021 Melrose Ave. in Los Angeles, CA and remains on display through April 22. In addition, from noon-3pm April 8, there will also be a book signing of Storytime: A Little Art Book, which has every piece Spiotto has done in this series through 2016. It’s also available at this link.